Drats, here I am up way too late again. Couldn’t resist watching my tivo’d Bachelor “Where are they now” which was mostly old footage, don’t they know faithful Bachelor fans will catch stuff like that?!! Still entertaining though, I was so mad, my DVR cut off the end where Brad was watching Deanna and Jesse on the show. Can anyone tell me what happened, it cut off while he was eating his sandwich! Never thought I’d see him on the show again. Ok, enough of that. 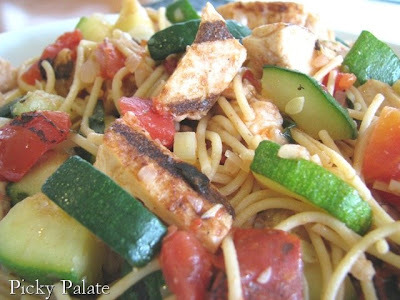 Here is a very healthful, full of great flavor, farmer’s market spaghetti I put together for dinner a couple nights ago. I love all the fresh veggis and very light sauce. It’s really good and quick to get on the dinner table. If you think your kids might have an issue with the veggis in this dish, spoon their spaghetti into bowls and cut it up into little tiny pieces with kitchen scissors so they have to eat it with a spoon. I do this with my boys pasta all the time and they don’t even realize they are eating veggis! Do check out my sister in law’s cute shabby chic Ladybug Lane boutique if you are in the market for some fun new decorations, she’s adorable and is so creative! Here’s to a great week and some good cooking! Next up is those incredible stuffed brownies that had my family in a feud because I didn’t make enough! 1. Cook pasta according to package directions. Drain and set aside. Place olive oil in a large sauté pan over medium heat. Saute zucchini, onion and leeks for 5 minutes, until softened. Season with a pinch of salt. Stir in garlic and cook for an additional minute. Add chicken, tomatoes, chicken, basil ribbons, cooked pasta, salt, garlic salt, pepper and olive oil. Toss to combine all ingredients and reduce heat to low. Taste and season according to your taste, I tend to like it a little salty! Enjoy! Looks good. Brad was just watching Jesse propose and then he changed the channel. Nothing great happened. This sounds really delicious and I happen to have all the ingredients! You just made my day by helping me decide what to make for dinner tonight! 🙂 Thanks! This looks like a great summer recipe. I wish I’d planted zucchini this year. I have been reading your blog for a while now and if you think you are up late, check the time on this bad boy! 3am. But I’m first to comment. This dish looks delish! I’m excited to try it. I’ve tried a few dishes and everyone of them have tasted as good as the picture looked. Thanks for sharing your talent with the rest of us. I love to cook, but I can never come up with my own stuff. Thanks again! That looks SO GOOD!!! Normally I don’t make much pasta in the summer because it’s too heavy, but I just may try this one! Thanks Jenny! That looks so yummy. Don’t you love those fire roasted tomatoes? I’d be all over this! I’m off to check out your sister in law’s boutique. Have a great day. Thank you so much for the Bachelor update, I figured it was probably no big deal. I always love when I don’t have to make a trip to the grocery store to make dinner. Hope you enjoy! Wish I had a garden! I’m trying to grow a basil plant and it’s not going so well. 3am? I’d be a zombie! My little one came in at 5:30am today, it’s my own fault I know my guys are early risers! Thanks for spending the time to comment! Hope to see you again soon here! I know, I don’t love all the heavy sauces when it’s hot out. This one is nice and light. Yes, I love Muir Glen, they are the best! Great looking summer produce dish! Oh, I missed the where are they now show. Didn’t know it was on. You have such a talented family! You with this wonderful cooking and baking, your siter with the clothing and now your sister-in-law! That’s great! I love zucchini, it’s probably my favourite veggie. The plate looks great! I imagine that dish tastes as good as it looks! Your pictures are making me hungry! I just made your Tuscan House Chicken and carrots. I roasted green beans and sliced onions in the oven drizzled with olive oil and s&p. YUM!! My kids ate it all. It’s rare I can find meals that all of my kids will eat. Thanks! Does anyone have a good zucchini bread recipe? Yah, you didn’t miss too much, the only new material was the last 10 minutes. I know, I could go for some pasta this morning. Thanks for the update Coleen! Glad the dinner worked out well with the family! I just got some fresh green beans and will be posting a fantastic recipe soon! Thanks for commenting! 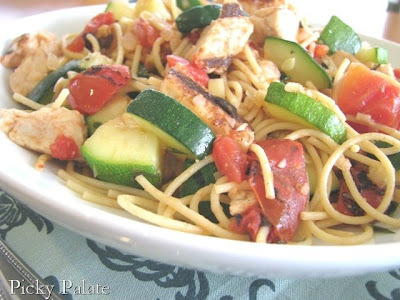 I’ve been wondering what to do with zucchini and we love pasta…so this is the perfect combo. Yum! I haven’t even watched the Bachelor in years, yet I got sucked into watching last night!! 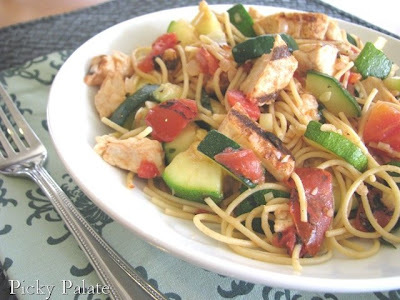 This looks like the perfect summer dish! Looks great Jenny! I’m going to have to wait for my fresh veggies in the garden. What are leeks, and where do you find your fire roasted tomatoes? Yum Jenny! This looks amazingly delicious! I will definitely have to give it a try! Have a happy week! 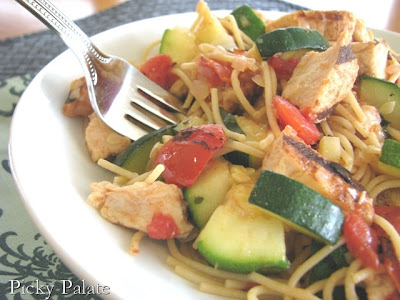 I’ve been loving adding zucchini in pasta lately, it really is a great combo. Enjoy! The Bachelor has a way of sucking you in doesn’t it, I get hooked every season even if I say I’m not going to! I am so jealous you have a garden, I think that’s be so nice. Leeks look like giant green onions. They are great sauteed along with onions, they jazz up the dish a bit. If you can’t find them at your grocer you can just add more onions. I get my fire roasted tomatoes at just about any grocery store, I think even Walmart sells them. Do look for the Muir Glen brand, it’s the best around. Enjoy! I heart your website. I have been a lurker for some time and decided to jump into the blog world. Thanks for the inspiration…I have bookmarked so many of your recipes to try. That looks nice and healthy and tasty! 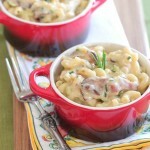 I love your pasta my dear, it sings summer! Thanks for visiting my blog Brooke! You are off to a great start with your new blog, it looks great! We all saw what happened to Robert the Chef who was on the Bachelor, he got the boot. Maybe your lasagna would land you the spot!! Ahhh..thanks for adding me to your blog list! Thats sooo sweet! And ya,,horror movies…I am SUCH a baby..I think the last one I saw was Blair Witch Project! And I was scared out of my mind! 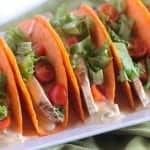 Jenny, A nice and healthy meal and great for the summer. I love those fire roasted tomatoes too, I always keep them stocked in my pantry. Mmmmmm! As always, something yummy to look forward to cooking! I love reading all about your wonderful cooking experiences! Stop by my blog…I have a little something for you there! Ok, so a million of my non-dental hygiene friends (in AZ and CA) have this link on their blog, and here you are! I searched your name on-line after dinner with Summer and Tammy the other night and can’t believe that you are the author that all my friends rave about. I just never took the time to check out the blog. Pretty funny. We are living in California now and I am dying to try out a few of your recipes. Sounds like life is good for you. Congrats on all you are doing. That is an awesome story! So good to hear from you, are you still practicing dental hygiene? Send me an email from my profile, I’d love to chit chat and see how you are doing. Please tell Summer and Tammy I say hello. Love the pic of you and your hubby! Oh wow, this looks so good. I haven’t had pasta in a long time. I have to say, I have made this twice since you posted it, and I love it! The first time, I used the colorful spiral noodles, and it looked really pretty. The second time, I used tortellini instead of the spaghetti, and my husband said it was his favorite. Thanks for the great recipes! looks healthy and delicious! i was upset that they replayed old footage for that episode too – most of it was just filler w/only a little bit here and there of new stuff (like deanna and jesse meeting trista and ryan). the part at the end w/brad was stupid – he watched their proposal and then changed it to a football game …you probably only lost 5 seconds of the ending.